Jim Shaw’s Seafood restaurant is a Macon, Georgia seafood tradition. Why do you have to go to the Georgia Coast for fresh seafood when you can get it at this establishment located on Vineville Avenue? Jim Shaw’s is on a very short list of my favorite places in Macon. Every time I have come here I have had a great experience. This was a fantastic restaurant and a great dining experience. 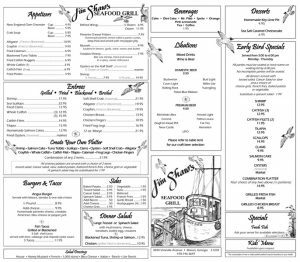 Copyright ©2018 Jim Shaw's Seafood & Grill. All Rights Reserved.